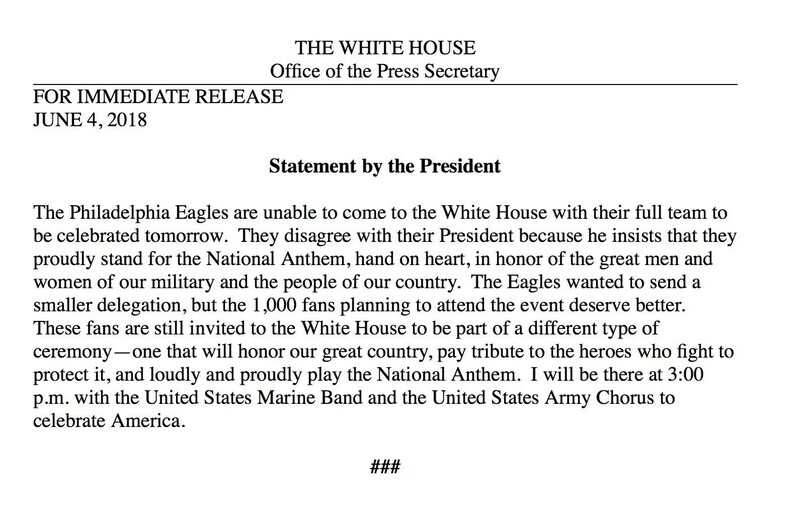 The Philadelphia Eagles were recently disinvited from the White House. A recent statement from President Donald Trump said that the 2018 Super Bowl champions were “unable” to come to the White House because “they disagree with their president” about standing during the national anthem. Here are the facts: Fewer than 10 Eagles had planned to attend the White House. So riddle me this: How does one disinvite guests from a party they’ve already declined to attend? This isn’t the first time athletes have declined an invitation to the White House. In 1984, Boston Celtics MVP Larry Bird refused to visit President Ronald Reagan. Michael Jordan skipped a meeting with President George H.W. Bush in 1991 to play golf. And in 2017, Steph Curry rejected Trump’s invite via Twitter.